The Grouse Mountain SkyRide is North America’s largest aerial tramway system and one of Vancouver’s major attractions. Seven days a week, every fifteen minutes, it takes passengers to the top of Grouse Mountain. The SkyRide starts at the base of the mountain at about 300 metres (1000 feet) and climbs to 1100 m (3700 feet) in twelve minutes. During the trip, you can see all of Vancouver and the surrounding area. It’s an exciting and informative ride for the whole family. You’ll feel like you’re on a European vacation. If you’re visiting from out of town, getting to the base of Grouse can be challenging. You can take the #236 bus from the North Vancouver bus terminal at Lonsdale Quay after taking the SeaBus across the Burrard Inlet. If you you have limited time or are part of a group, this is the most convenient way to travel and it’s more affordable than you may think. Call 604-990-9299 or 800-913-9207 for more information and reservations. In winter, you can ski, zipline, snowboard, snowshoe, ice skate or enjoy a sleigh ride or helicopter tour. All year round you can watch the high definition video presentation, Born To Fly, about the history of Grouse Mountain, eat at the gourmet Observatory Restaurant, the Altitudes Bistro, Lupins Café, Rusty Rail BBQ & Grill or the Grouse Grind® Coffee Bar. 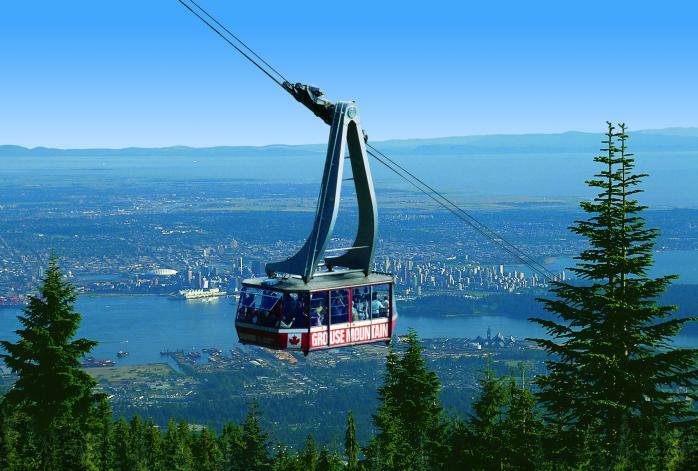 To get to the base of the Grouse Mountain SkyRide, cross the Lions Gate Bridge. Take the North Vancouver exit to Marine Drive, then turn north (left) at the first intersection, Capilano Road. Stay on Capilano Road for 5km (3.1 miles) until the road ends at the Grouse Mountain parking lot. By public transportation, take the SeaBus to the Lonsdale Quay in North Vancouver. Take bus #236 to the Grouse Mountain parking lot. An alternative is to take bus #246 on West Georgia St across the Lions Gate Bridge to Edgemont Village. From there, transfer to bus #232 that will take you to the Grouse Mountain parking lot. For more information, check out the Grouse Mountain website or give them a call at 604-980-9311.